Size – Males - 22 to 27 inches. Females - 21 to 26 inches. Midrange dog preferred. Proportion - Length well proportioned to height. Should be equal in height from highest point of the shoulder blade to the ground as long measured from sternum to the buttocks. Slightly taller at shoulder than at hips. Substance - Weight should be in proportion with height and bone structure. Working dogs not to be penalized for being slightly underweight. Well boned according to size of dog. Expression - Pleading. Eyes - Dark brown to hazel in color, dark preferred. Set well apart. No drooping eyelids. Eyes round in shape. Faults-Yellow eyes, drooping eyelids. Ears - Set moderately low, fine in texture. Reaching near the end of the nose when stretched out. Proportioned to head. Faults -Stiff to the touch. Appearing to be attached only to the skin, instead of firmly attached to the head. Skull - Moderately broad. Shape is flat. Faults-Narrow across top, excess of dome, pointed dome. Muzzle - Square. Well balanced with other features of the head. Faults - Dished or upturned muzzle. Not in proportion with head. Nose - Nostrils large and open, black in color, never pink. Faults - Any color other than black. Teeth - Scissors bite preferred. Even bite acceptable. Faults - Overshot or undershot. Neck - Medium in length, strong, slightly arched and held erect, denoting proudness. Throat - Slight fold of skin below the angle of jaw, clean throat is permissible. Faults - Too long, too thick, not in proportion with head and body. Topline - slightly taller at the withers than at the hips. Fault - Hips higher than withers. Body – Chest - Deep, broad. Ribs - Well sprung to provide optimal lung capacity, denoting stamina. Back - Strong. Faults - Roach or sway back. Loin - Slightly arched. Tail - Medium length, very slight brush and saber-like. Faults - Not strong at root, heavy brush, Setter-like plume, curl tail. Shoulders - Clean and muscular. Shoulder angulation should have a perfect 90- degree angle or close. Legs - Straight, well-boned. The forelegs will be set under dog and feet under his withers, not under ears. Pasterns - Straight, well set, clean and muscular, denoting both speed and strength. Faults - Forelegs crooked, out at elbows. Feet - Cat-paw type, compact, well padded. Toes - Stout, strong and well-arched. Nails - Well-set. Faults - Flat feet, open feet, hind dewclaws. Solid red preferred. Dark muzzle and small amount of white on brisket and feet permissible. Faults - White on feet extending beyond toes. More white on brisket than an open hand will cover. White stockings on legs. Determined, steady, and proud, with good reach and drive. Temperament: Even-tempered at home but an aggressive hunter. Amenable to formal training. A good family dog that likes to please. Click Here to Learn about breeder background checks on Redbone Coonhound breeders if you are looking for Redbone Coonhound puppies for sale. Click Here to learn how ResearchBreeder.com can help you find healthy Redbone Coonhound puppies for sale.Redbone Coonhound puppies for sale. Click Here to order a Breeder or Kennel Background Check on Redbone Coonhound Breeders that may have Redbone Coonhound puppies for sale. Click here to find the national breed club for Redbone Coonhound puppies for sale. 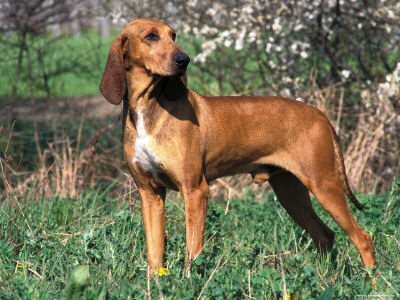 Click Here to purchase a list of approved ResearchBreeder.com Redbone Coonhound Breeders who have Redbone Coonhound puppies for sale.